Old San Juan is the soul of Puerto Rico. Along its cobblestone streets are ancient structures that precede anything you'll find in New England. 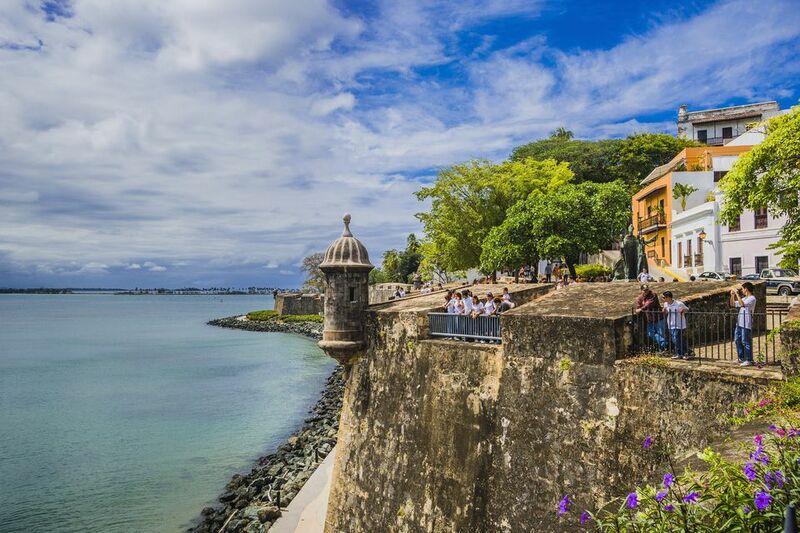 Protected by its two proud forts, the walled city of San Juan recalls a past era, and yet dazzles with sophisticated restaurants, charming hotels, and a sizzling nightlife. No visit to the island would be complete without a trip to Viejo San Juan, as the locals call it. Sheraton Old San Juan - located right on the waterfront. The Gallery Inn - A warm, inviting place full of art and whimsy. Hotel Milano - You can't beat its location in the heart of the old city. S.J. Suites is basic, but right in the middle of the action and spacious. Da House - A funky, bohemian place and a tremendous value. La Caleta is a truly budget option that gives you more than you'd expect. Dragonfly - An Asian-themed restaurant and lounge and one of the hottest destinations in San Juan. Panza - Top-class innovative cuisine in a polished, elegant setting. El Picoteo - For those who love traditional Spanish tapas. 311 - Classic French cuisine in a beautiful restaurant on Fortaleza Street. La Fonda del Jibarito - For hearty, rib-sticking Puerto Rican cooking. Fratelli - A great spot for classic Italian fare and the late-night bar & lounge scene. The Catedral de San Juan, one of the oldest churches in the Americas. While you're at it, try to make time for at least one of Old San Juan's "boutique" museums. You can also take a tour of the old city. Night Tales in San Juan , offered by Legends of Puerto Rico, Inc., is one of the most original ways to see the city. But most of all, take a stroll and lose yourself in the beauty and charm of Old San Juan. Custo Barcelona for young, hip styles. Punta Pie for high-quality men's and women's shoes. Clubman for formal men's clothes and a decent selection of guayabera shirts, which are typical tropical island wear. Where you end up at night will depend entirely on what you like to do. Salsa dancers will want to hit Nuyorican Cafe, a tucked away gem of a place with excellent live music, or La Rumba on San Sebastián Street. Club-hoppers will head to Club Lazer, a multi-level nightclub that stays open past dawn. Those who like lounges will prefer the cool calm of Dragonfly or Marmalade, both on Fortaleza Street. Barflies will love Nono’s on San Sebastián Street and the grungy El Batey on Cristo Street. And finally, the Spring Break crowd will find a familiar home at Señor Frog’s. The art galleries of Old San Juan. Displaying a wide variety of local and regional art, these galleries are worth a visit, especially on Noche de Galerías, which takes place the first Tuesday of every month. On this night, the galleries throw open their doors late into the evening and serve wine as minstrels wonder the streets to entertain you.